Now, this is really simple. Honest. 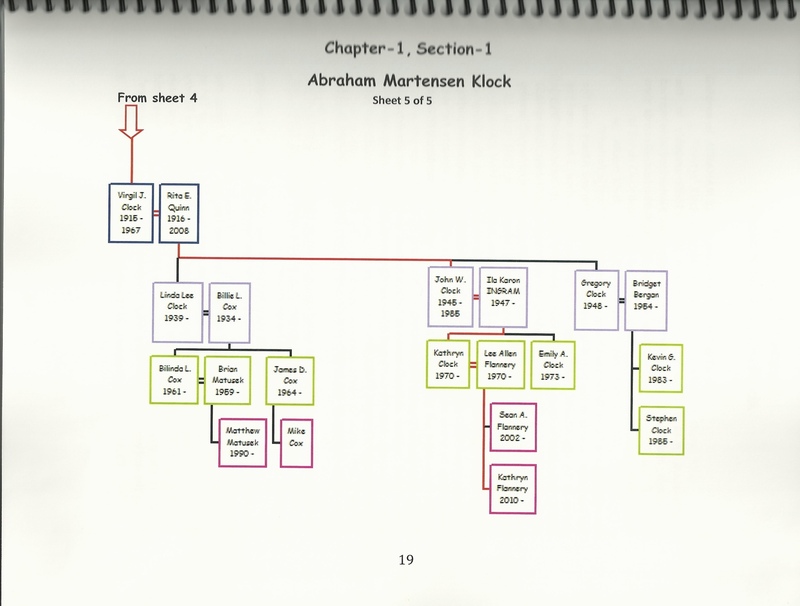 This family tree begins with my grandparents (Wilkie Clyde Clock & Margaret McCullick Clock) represented by the large red arrow at the top of the page. The next level down (blue) represents the 6 children they had together (Charles in my case). This page is only large enough to contain 4 of their 6 kids, the other 2 children are on the next 2 charts, below this chart. The double horizontal represents a marriage (Cornelia Ellen Collins)in my example). The line going down represents the children of any marriage. So the grey boxes are Wilkie & Margaret’s grandchildren (Barry, me, in this example). The green/yellow boxes represents their great grandkids (my kids, Kevin & Kristy). Beneath them are their great great grandkids, in red boxes (Tristen & Taylor, Kristy’s children …not listed on the chart) That’s all there is to it! NOTE: Wilkie Clyde & Margaret M. Clock (my grandparents) are the connecting link between the upper 3 charts and the lower 2 charts. WCC was the son of Jacob Wilkie & Margaret A. Clock (listed on the lower 2 charts). And Wilkie & Margaret were the parents of the 6 Clock kids (including Charles, my dad), listed on the upper 3 charts. In other words, they fit in between the the two groups of charts. Perfectly confusing, right? Not really …give it a try! Also simple to use. The upper chart is the next in the Clock family tree, going back in time. 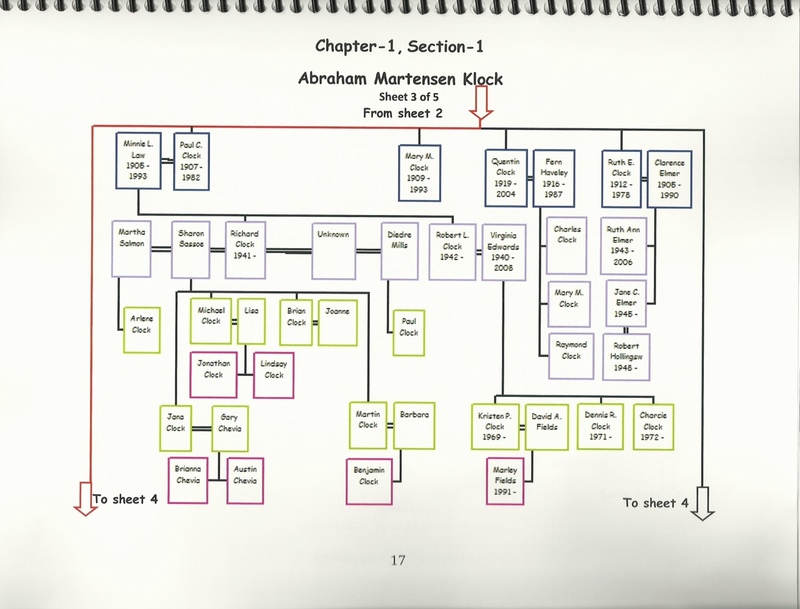 This Clock family chart (the most recent of the 2 lower …older genealogy charts) includes: John Clock, then Jacob Clock, then followed by Abraham Clock (my great great grandfather), then Jacob Wilkie Clock (my great grandfather) …and their wives. 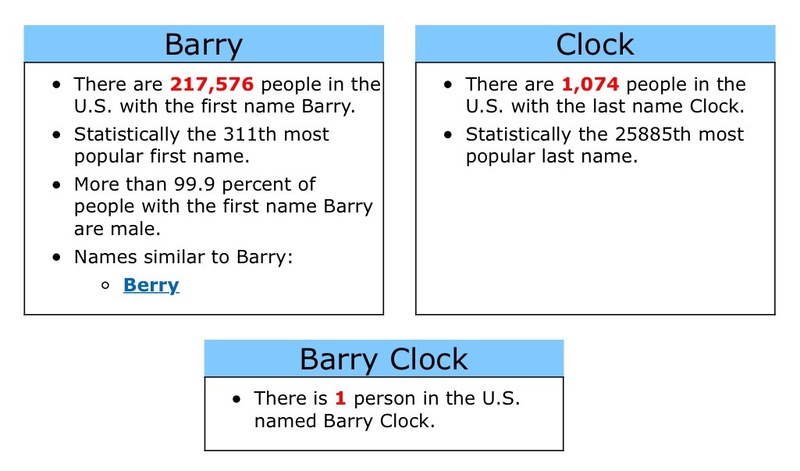 (*NOTE: There are two Clocks named Jacob and two named Abraham on these charts.) During the time period this chart covers, the Clocks lived in New York, Connecticut, and some joined the westward movement and headed out “west” to Ohio, Indiana and on to Kansas. Later generations of this line of Clocks (after this chart) eventually made it all the way across the country, settling in Oregon, Alaska and Washington. Others are in still in Kansas and some are near where JWC ended up, in Oklahoma and Texas. Today …some of us are scattered by the wind, to South Australia, Saudi Arabia, Jordan and heaven knows where else. 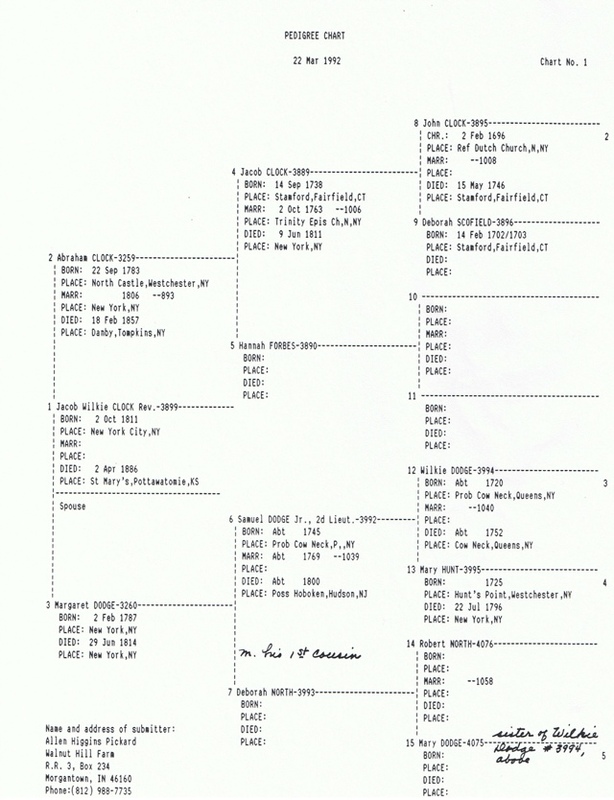 At the very bottom is the earliest of the Clock/Klock family tree charts, covering the time period of 1640 – 1746. It includes: Abraham Martensen Klock/Clock (my great X6 grandfather), then Albertus Clock, then John Clock and their wives. (*NOTE: There are two of our ancestors in the family tree named Abraham & two named Jacob, also.) 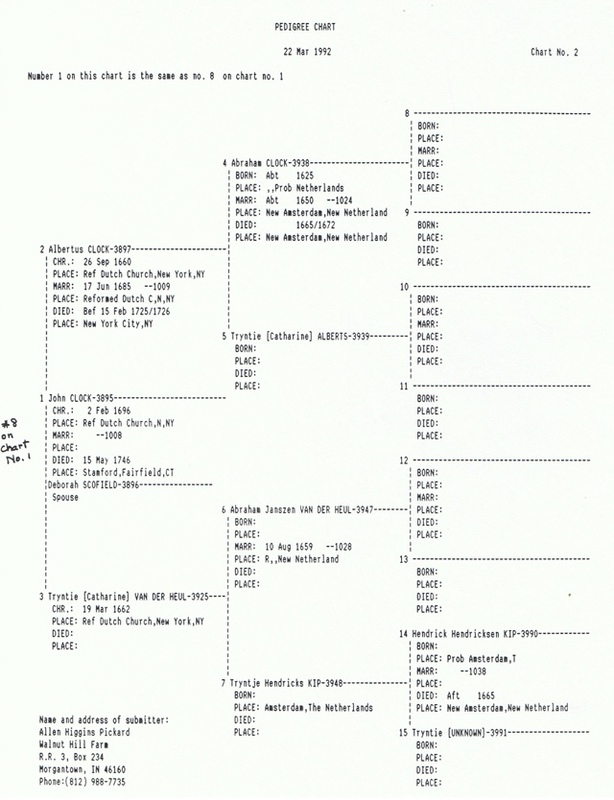 The bottom genealogy chart covers the time period when our ancestors still lived in back in The Netherlands (Holland) and moved across the ocean to New Amsterdam, the largest town in the Dutch colony of New Netherland. They continued to live in early New York City, NY, after it became a British colony. But eventually they moved to other parts of New York state and into Connecticut. It is all somewhat surprising, because I grew up hearing that we were of of German ancestry (“blockheads”), never heard a word about us being Dutch. Also, my impression always was that the Clocks came to America in the late 1700’s, not way back around 1650. In fact JWC’s “Autobiography” also states the above two apparent errors. Kind of strange, since you would think he would know the story of the generations immediately before him. A little bit more about blockheads in our family. Kinda funny. Occasionally Dad and Mother would go back and forth with each other regarding their heritage, in a humorous way. Mother was quite proud of her Indian heritage, Dad (if it was even true) …not so much! So sometimes it would turn into a “blockhead” poke at Dad ..a reference to his German (Dutch) background and large, rather square head. He would reply that having a big head just meant more room for brains. But it was true, he did have a extra large hat size. As did I. Football helmets, baseball caps, finding any hat that fits is a problem. Size #7 1/2 or 7 5/8. If you don’t know hat sizes, but that’s BIG! I think it is probably the same for my brothers and most likely a number of the Clock guys across the country.. Funny thing is, a couple of years ago, I went in to buy my (then) 7 year old grandson, Tristen, a cowboy hat before the rodeo. NOT ONE of the kid sized hats fit him. Not even close! Finally had to get him a small adult sized one. At 7 !! Blockheads. There may be an explanation of the Clocks national origin issue (are they German or Dutch?). I have heard, from an ex-student, that there was a large group of people driven out of Germany/Prussia. They fled down the Rhine River to Holland, then immigrated to Britain briefly, before immigrating on to the New Netherlands/New York area in America. (SEE: Palatine Germans page in this blog, if you are interested). During these 3 Clock’s lifetime (on this bottom chart), the area they lived in became the British colony of New York. And of course New Amsterdam was renamed New York City. That is why there are numerous Dutch place names in NY and NYC today, for example, even Wall Street has Dutch origins, from the old stone wall that was once located nearby. 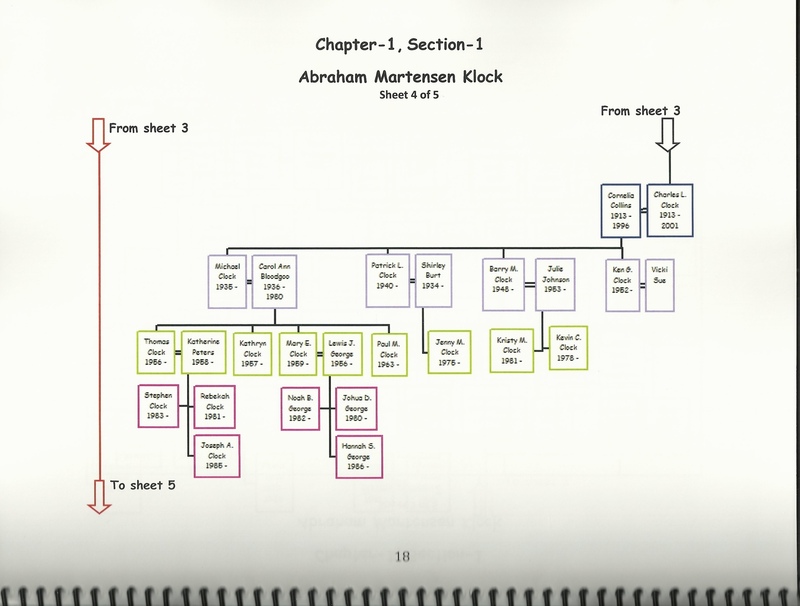 (The bottom 2 family tree charts were done by Ruth Pickard. She is a descendant of Caroline Clock, older sister of Jacob Wilkie Clock, my great grandfather). This entry was posted in ABRAHAM CLOCK & BEFORE, BARRY MARK CLOCK, CHARLES LEWIS CLOCK, JACOB WILKIE CLOCK, WILKIE CLYDE CLOCK. Bookmark the permalink.